Red signifies potential nectar sources for hummingbirds. "Empress of India' nasturtium, Scarlet sage, and 'Torch' Mexican sunflower are three red annuals with irresistible nectar. The color red operates as a siren for nectar-loving hummingbirds. 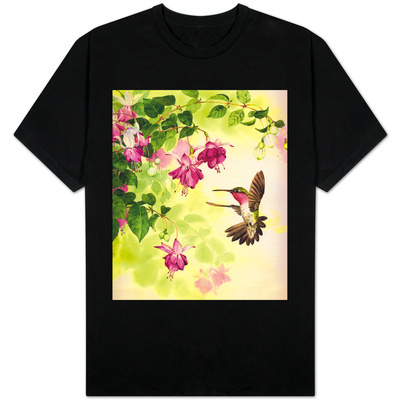 Red flowers signify potential nectar sources which draw hummingbirds irresistibly to them. • 'Torch' Mexican sunflower (Tithonia rotundifolia 'Torch'). Tropaeolum majus, known commonly as garden nasturtium, is an New World native annual, with altitudinous homelands in northwestern and west central South America's Andean countries from Bolivia north to Colombia. With U.S.D.A. plant hardiness classification through Zone 9 (minimum winter temperatures: 20° to 30° F.; -7° to -1° C.) to Zone 11 (40° to 50° F.; 4° to 10° C.), Tropaeolum majus has found worldwide appeal as a cultivated plant. Thriving in full or half sunlight, garden nasturtiums climb to a height of 10 feet (3 meters), with an equiproportionate spread of 10 feet (3 meters). Striking leaves are colored dull green to glaucous (Greek: γλαυκός, glaukós, “blue-green, blue-grey”). Also leaves are peltate, that is, nearly round in shape and attached to the stem via a petiole (Latin: petiolus, “little foot”), a stalk which terminates near the middle of the underside of the leaf. Garden nasturtium blazes with brilliant flowers in shades of orange, red, and yellow. Especially beguiling for nectar lovers is 'Empress of India' cultivar, with the stunning contrasts between its blue-green leaves and dazzling red flowers. Among the parade of admirers of 'Empress of India' is calliope hummingbird (Selasphorus calliope). A New World native, with nesting grounds in western United States and Canada, calliopes traditionally winter in southwestern Mexico and its Central American neighbors, Belize and Guatemala. Scarlet sage (Salvia splendens) is native to Brazil, where it thrives as a perennial (Latin: per, "through" + annus, "year"), especially at elevations of 6,600 to 9,800 feet (2,000 to 3,000 meters). as a perennial for Zone 8 (minimum winter temperatures: 10° to 20° F.; -12° to -7° C.) through Zone 11 (40° to 50° F.; 4° to 10° C.). Salvia splendens welcomes full sun and reaches a maximum height of 8 to 48 inches (20 - 120 centimeters), with a maximum spread of 8 to 32 inches (20 - 80 centimeters). Oval green leaves with serrated margins surge with scarlet sage's multiplicity of branching stems. The 'Sizzler' series of cultivars provides a cornucopia of colors, including burgundy, lavender, pink, red, salmon, and white, as well as bi-colorations. Ruby throats are drawn to the resplendent beauty of Salvia splendens, especially 'Van-Houttei' cultivar, for nectar enjoyment. Salvia splendens 'Van-Houttei' entices hummingbirds, especially ruby throats (Archilochus colubris), with its spectacular wine-colored flowers. mid-United States from the eastern fringes of the Great Plains eastward to the east coast. Ruby throats migrate to live as snowbirds in southern Florida and from southern Mexico through every Central American country all the way into western Panama. New World native annual Tithonia rotundifolia, known commonly as Mexican sunflower, has homelands in North America, from Mexico southward, encompassing every Central American country except Honduras. Naturalization has extended Mexican sunflower's range to new homelands worldwide, with special thriving in west central to southern Africa, eastern Australia, eastern South America, and southeastern United States. Tithonia rotundifolia is classed as hardy through U.S.
A member of the daisy family (Asteraceae), Tithonia rotundifolia is valued for its lengthy blooming, from summer to the first frost. Appreciative of full sun, Mexican sunflowers reach a maximum height of 3 to 6 feet (0.9 - 1.8 meters) and spread to about 2 feet (0.6 meters). Velvety-hairy leaves, measuring 12 inches (30 centimeters) in length, festoon the many-branched stems of Tithonia rotundifolia. Orange ray flowers encircle tufted yellow centers. Mexican sunflower's 'Torch' cultivar regales hummingbirds, especially Anna's, with nectiforous orange-red flowers. New World native Anna's Hummingbird (Calypte anna) hugs western North America, from Canada south to Baja California, for nesting and wintering. Native to the west coast of North America, from Mexico through the United States and Canada, Anna's Hummingbirds delight in the nectar promises of the spectacular floral display of Mexican sunflowers, especially 'Torch' cultivar. Red is a color in nature in which hummingbirds place their faith for provision of nectar delights. As with humans, red serves as stoplights for hummers. 'Torch' Mexican sunflower (Tithonia rotundifolia 'Torch'). Backyard enthusiasts wishing to attract faithful visits from happy hummingbirds are rewarded by including these red annuals in their flower beds. Easy to grow and thriving in full sunlight, these carefree annuals proliferate in back yards as well as in container gardens. There is no down time in appreciating these three red annuals, for their flowers prettify the landscape long before and after visits from gorgeous hummingbirds. Mexican Asters are hardy annuals, with pink, purple, or white flowers, that also draw hummingbirds. Diligent deadheading encourages repeat blooming of Salvia splendens. Flora: A Gardener’s Encyclopedia. Volume I: A-K. Portland OR: Timber Press, 2003. Flora: A Gardener’s Encyclopedia. Volume II: L-Z. Portland OR: Timber Press, 2004. McKinley, Michael. Ortho's All About Attracting Birds. Des Moines, IA: Meredith Books, 2001. Newfield, Nancy L., and Barbara Nielsen. Hummingbird Gardens: Attracting Nature's Jewels to Your Backyard. New York: Houghton Mifflin Company, 1996. 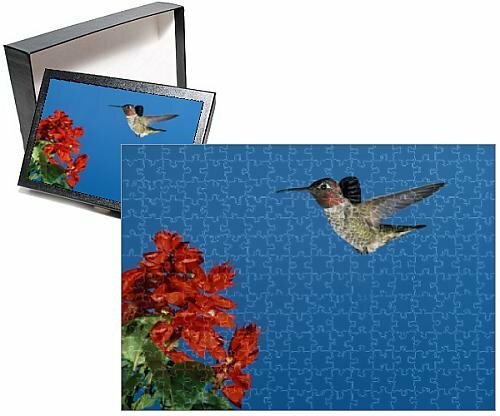 Ortho's All About Attracting Hummingbirds and Butterflies. Des Moines, IA: Meredith Books, 2001. Roth, Sally. 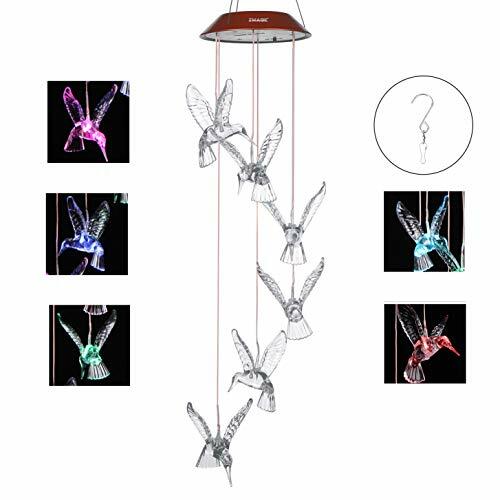 Attracting Butterflies & Hummingbirds to Your Backyard. Rodale Organic Gardening Book. Emmaus PA: Rodale, 2001. Garden nasturtium's flowers and leaves are edible; also, their exquisite seeds substitute deliciously for capers (Capparis spinosa). 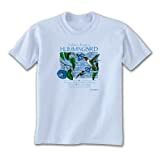 A companion piece to the popular "Advice from a Tree" t-shirt and book, Advice From A Hummingbird will delight any bird lover or self-help enthusiast. Shirt Text: Sip the sweet moments / Let your true colors glow / Don't get your feathers ruffled over little things / Just wing it / Take yourself lightly / Keep your visits short and sweet! VioletteRose, That's lovely that Mexican sunflowers grew in your parents' garden. Mexican sunflowers are quite stunning, so it's good to know that you can have as many flowers as you want because of their fast propagation and floral profusion. 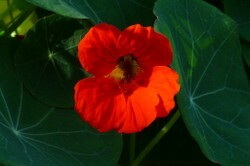 Both scarlet sage and nasturtiums make spectacular contributions to gardens. Perhaps you'll see them some day for they are admired worldwide. Mexican sunflower plants used to grow by its own in my parents garden and they propagate very fast and produce lots of lovely, colourful flowers. I love those flowers. The other two red flowers too look very pretty but I have no experience growing them. These bright coloured flowers definitely look great in any garden, and it is a bonus that they can attract hummingbirds! Marigolds (genus Tagetes) are New World natives with Old World charm. Annual Phlox, garden balsam, orange jewelweed, garden nasturtium, and tree tobacco are five annual plants which are attractive to hummingbirds.